More evidence that the LEFT is losing their minds and just cannot accept they lost and Donald Trump won. Former Vermont Gov. 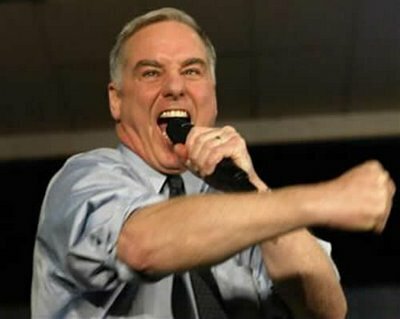 Howard Dean called President-elect Donald Trump’s chief strategist pick Steve Bannon “a Nazi.” Way to go Howie, could you be less productive? This is what the irrational LEFT does, when they got nothing. The reality is, this is why the LEFT lost. America got tired of anyone who doesn’t agree with Democrats being called a racist, sexist, anti-gay, anti-anything, and oh yes, a Nazi. This is right out of the Democrat playbook. How do we know? Why Wikileaks of course. In an interview Bannon stated, “I’m an economic nationalist. I am an America first guy.”For some reason Democrats like Dean have an issue with a White House administration putting America first. That could be another reason why Dems lost in 2016. Because this loon has so much credibility … Dean is still screaming, or is it whining? Bannon, a former executive chair of alt-right Breitbart News, was appointed by the President-elect to serve as chief strategist, making him one of the most powerful people entering the White House with Trump come January. The position does not requite Senate approval. Following Barack Obama’s speech where he proposed a “keep your plan” fix for Obamacare, former Vermont Governor, DNC Chair and Democrat presidential candidate Howard Dean pondered while on MSNBC whether Emperor Obama had the legal authority to even propose such a “FIX” as the law had been passed by Congress. Hmm, many Conservatives are asking the same question regarding Obama’s actions. Wow, does that make Dean a racist? So what is it with Barack Obama? Does he think because it is called Obamacare that he has the legal authority to change any part of the law he feels by executive fiat? Imagine if a Republican did that with abortion? When Republicans confront Obamacare, they are constantly told that it is the law of the land. Really? If it is, then how come Barack Obama thinks he can just change it himself? Maybe the real probalem with Obama is that he was too busy reading the Communist Manifesto as a youth instead of watching School House Rock and “I’m Just a Bill”. Former Vermont governor, Democrat presidential candidate and DNC Chair Howard Dean has threatened to leave the Democrat party over Barack Obama’s proposed budget. Dean stated, “I just think that’s unacceptable. If this passed I would have to reevaluate if I belong in the Democratic Party. If this were passed with Democratic votes, I think it would be impossible to be Democrat.” Does Obama’s budget have a chance of passing and getting Democrat votes, Dean does not think so. Folks on the LEFT are calling this Dean’s Obama scream. If Howie leaves the Democrat party, there is always the socialist party for him to turn to. Howard Dean has had it with President Obama’s budget proposal, saying the plan put forward by the White House might just drive him from the Democratic Party he once led as DNC chair. On Sunday night, Dean tweeted that the restoration of some defense sequestration cuts contained in Obama’s budget proposal were a step too far when coupled with the president’s entitlement cut proposal that progressives like Dean are already livid about. “If this is true I may have to become an independant [sic],” Dean wrote, before linking to an April 10 article by Bloomberg BusinessWeek’s Josh Green. NewBusters asks, Will the media notice this story? Whether they wish to or not, there is a civil war a brewing in the Democrat party. Dana’s perspective on the Shirley Sherrod fiasco and the radical rants from the LEFT and Howard Dean. Far be it from Howard Dean to let the fact get in the way of using the RACE CARD. Democrat Howard Dean and the race baiting LEFT were at it again this morning on Fox News Sunday. It would appear that Dean has learned nothing from the Shirley Sherrod racist incident. Howard Dean took his race baiting ways on FNS and was handed his lunch by host Chris Wallace. Dean stated that FOX News was complicit in the firing of Shirley Sherrod, yet what Dean deems to have forgot is that FOX News did not cover the story until she had been ousted by the Obama Administration. That is when Chris Wallace let Dean have it with both barrels and Dean folded like a cheap suit and stammered trying to find the words as he was caught completely flat footed and in his liberal, progressive lies. The VIDEO is priceless, because Howard Dean when confronted with the truth was speechless.